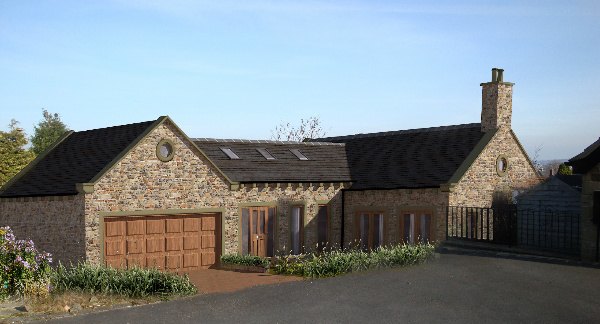 Bespoke new dwelling within quiet cul-de-sac, close to Baildon Moor, near Bradford / £200,000 approx. We were originally appointed to provide a full architectural service for this project, including interior design and on-site project management services in 2011, and having recently obtained full planning permission via Bradford Council, at the first time of asking, works are now very close to starting on site. The site lies close to Baildon Moor, on the northern outskirts of Bradford and is fairly generous in terms of overall area however, there were a number of restricting factors when carrying out the initial architectural design, such as site access, the proximity of surrounding dwellings and the overall height of the other buildings in the immediate vicinity. We decided that a fairly traditional intervention would be required from an architectural perspective, with the external stonework and roofing materials closely matching those of the adjacent dwellings however, from an internal perspective it is intended to provide an exciting, contemporary home with many interesting focal points. The ground floor accommodation will comprise of an integral double garage adjacent the cul-de-sac and a large hallway with access to a 4th bedroom and en-suite. The hallway will feature a wide staircase leading down into a glorious open plan living, dining and kitchen area, featuring contemporary fitted kitchen and extensive bi-folding doors onto a decked area overlooking the enclosed rear garden. The front of the living space will feature two pairs of glazed double-doors onto a separate terrace area, ideal for late afternoon and evening meals during the summer months. At first floor the main staircase will lead onto an open gallery landing with a large bedroom and en-suite accessed at each end. A smaller guest bedroom and house bathroom will be located within the centre of the first floor accommodation. Due to height restrictions, the first floor area will be naturally illuminated via Velux type windows, attractive dormers and feature “bullseye” windows located within the gable walls. We are particularly pleased about the prospect of another one of our new dwelling projects starting on site in the Bradford area, and will be providing numerous updates and progress photographs into our architectural blog over the coming months as work progress…..